Stability is its strength : With this wheelchair scale, the extremely high loadbearing capacity of 300 kg makes even the weighing of heavy patients a simple matter. 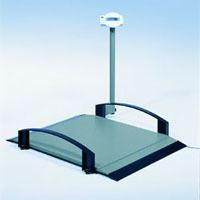 The extremely flat step- on surface and the automatically lowered ramp make it easy for wheelchairs to move onto the scale. The side rails also provide security. While the integrated Pre- TARE function detemines the patient's net weight within seconds, the HOLD function can display the weight a few seconds longer even after leaving the scale. The swivelling display at the wheelchair user's eye level, conbined with the large numerals on the display, make it convenient for both patient and nursing staff to read off the result. With just a few movements, the seca 664 can be folded together and easily moved on its transport castors.